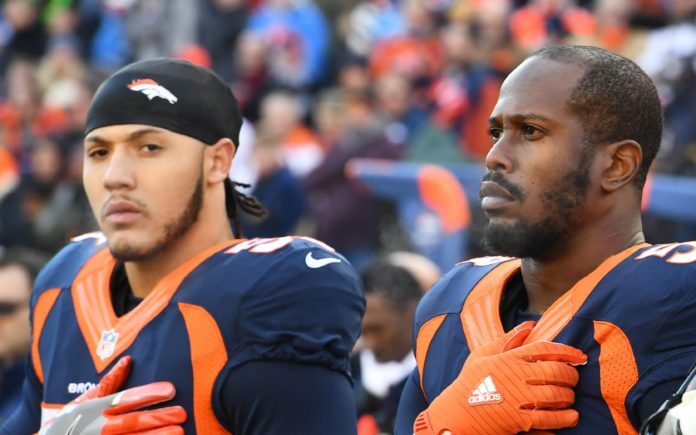 Shane Ray and Von Miller. Credit: Ron Chenoy, USA TODAY Sports. Since Von Miller entered the league in 2011, he has anchored a group of linebackers that consistently ranks among the best in the NFL. That looks to be the case again in 2018 as Miller leads what is, on paper, another strong assemblage of talent. Just days ahead of training camp, here is a look at the Broncos’ linebacker position in 2018. Miller’s ascension to the pinnacle of NFL defenders has been well-documented over the years. After rising to No. 2 on NFL’s top 100 list last year, Miller placed No. 9 this season, the second-best defender (Aaron Donald, No. 7) and top linebacker. He’s eclipsed double-digit sacks in each of his six healthy seasons, despite drawing double-teams on nearly every snap. In seven seasons as a Bronco, Miller’s 83.5 sacks rank second in team history behind Simon Fletcher (97.5). Lining up on the opposite side of the tight end, Miller is one of the best pass-rushers in the NFL, and that should only continue in 2018, as teams will be forced to focus more attention on the rest of the linebackers. He’s been a first- or second-team All Pro in all six of his full NFL seasons. Health providing, Miller will continue that this year. After playing as a starter in each of the last two seasons, Davis earned a three-year, $15 million contract this offseason. He led the Broncos in tackles in 2016 and continued his growth last season, especially in run defense. He recorded 82 tackles last year, despite playing in just over half of the snaps on defense. Pro Football Focus (PFF) graded Davis an 86.1 in run-defense situations, the 15th-highest grade among linebackers. He’s the latest of undrafted free agents to make a serious impact on Denver’s defense and is one of the team’s surest tacklers. Brandon Marshall’s presence in the middle of the Broncos’ defense is paramount. Since assuming a full-time job in Denver in 2014, Marshall has proven to be a steal and an integral part of Denver’s defense. Last year, Marshall played with a torn rotator cuff from Week 4 through the end of the season. Despite that injury, Marshall still led the Broncos with 106 total tackles. That said, he played inconsistently in other aspects on defense and earned a PFF grade of 54.6, just 53rd among linebackers. After being listed at 250 pounds last year, Marshall said he is down to 225 pounds after OTAs this year. Rookie Josey Jewell and third-year player Zaire Anderson could push for playing time behind Marshall and Davis if they prove themselves on special teams. Selected in the fourth round this year, Jewell left Iowa as the Hawkeyes’ all-time leading tackler and reigning Jack Lambert Award winner as the best linebacker in college. Anderson played well on special teams last year and earned some time on defense, notching 20 total tackles and returning a fumble for a touchdown. Stop me if you’ve heard this before, but Barrett has developed from an undrafted free agent into a starter on Denver’s defense. In three years with Denver, playing mostly as a backup, Barrett has totaled 109 tackles, 11 sacks, seven forced fumbles and three fumble recoveries across 15 starts. Fourth-year linebacker Shane Ray will certainly compete with Barrett for the starting SLB role. After planning to undergo another wrist surgery this offseason, the oft-injured Ray avoided the surgery and could now be ready for Week 1 against the Seattle Seahawks. Ray’s sophomore season, during which he recorded eight sacks, had him well on his way to what seemed like a breakout third year. Unfortunately, the wrist injury derailed his season as he missed the first eight games and only had one sack the remainder of the season. Still, the former first-round pick showed he has the talent to be a quality edge rusher during his healthy NFL seasons. The battle between Barrett and Ray at SLB figures to be one of the biggest position battles this training camp.